What is consciousness and how can a brain, a mere collection of neurons, create it? 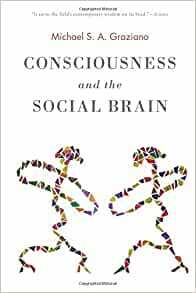 In Consciousness and the Social Brain, Princeton neuroscientist Michael Graziano lays out an audacious new theory to account for the deepest mystery of them all. The human brain has evolved a complex circuitry that allows it to be socially intelligent. This social machinery has only just begun to be studied in detail. One function of this circuitry is to attribute awareness to others: to compute that person Y is aware of thing X. In Graziano's theory, the machinery that attributes awareness to others also attributes it to oneself. Damage that machinery and you disrupt your own awareness. Graziano discusses the science, the evidence, the philosophy, and the surprising implications of this new theory. Now in an affordable paperback edition! Start reading Consciousness and the Social Brain on your Kindle in under a minute. Michael S. A. Graziano, Professor of Neuroscience and Psychology at Princeton University, is an internationally renowned scientist and an award-winning novelist. His books include the popular science title God, Soul, Mind, Brain and the short novels The Divine Farce, The Love Song of Monkey, and Death My Own Way. Extremely well written exposition of his new theory of consciousness, Attention Schema Theory. I believe that this book deserves to be widely read by anyone interested in consciousness and how it is manifested. The theory may turn out not to be the right answer but I suspect that, like the theories of Darwin and Newton, it will be expanded and built on in the future, rather than being discarded as wrong. A pleasure to read, this is a book that I plan to return to. Quite repetitious, but well worth reading. Examples and down-to-earth explanations made for an easy read. A compelling and lucid explanation of what consciousness is and is not. A major contribution to the field. This book is for everyone who is curious about the nature of conscience and who is ready to put in a bit of effort. The book has two aims: exposing a theory and convincing you of its validity. It manages its first goal brilliantly. I have no formal training in neuroscience or psychology but the author starts from first principles and sticks with them. A good analogy to the experience of reading this was reading the proof of Godel's theorem. Starting from scratch I still got access to a hugely important idea. As to the second goal, in order to be fully convinced I will need to read criticism of the theory. So far I haven't found much on the web, and all I read was either circular ("I take such preconceived idea as obviously true, the book contradicts it, so the book must be wrong"), or objections that had been thoroughly addressed in the book. The book has important applications, notably on areas of exploration for neuropsychology (obviously) but also AI and ethics. One thing left me a bit disappointed. The author courageously addresses the impact of his theory on the divine. He less courageously leaves aside the full consequences of the difference between what he terms Type B Awareness (our brain models attention in others) and Type A (our brain models our own attention). Surely to be conscious, an entity must exhibit Type A (being able to model attention), and not simply be attributed Type B (being the subject of an attention model)? It did feel easy to just say the difference cannot be tested, compared with the very high level of rigour the rest of the book reaches. this is most clearly written book I ever read about consciousness, very logical cases and explanations.